It's been said that baseball is a game so fine, it's played on diamonds. And in Charm City, we know our baseball! 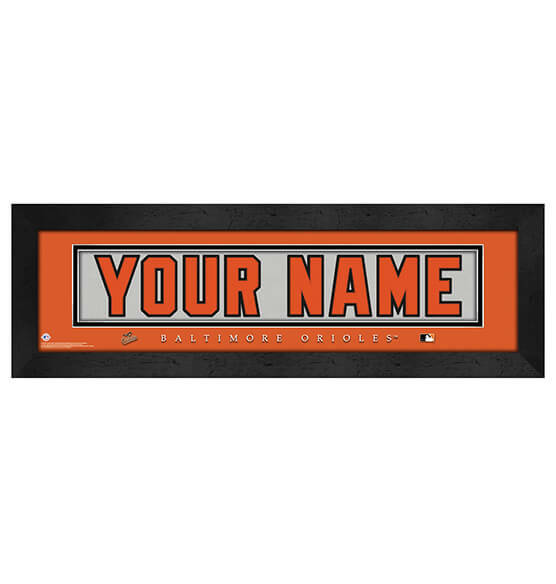 Customize this fantastic Baltimore Orioles Personalized Framed Nameplate Wall decor for yourself or for an epic gift that the recipient will cherish forever. Designed to look like the back of a Baltimore Orioles jersey, this premium sports decor features a striking double-mat inset with team colors. This conversation starter has a sleek black frame that comes ready to hang and includes a convenient sawtooth hanger on the back. Great for any die-hard O's fan occasion: birthdays, anniversaries, graduations — or just because.